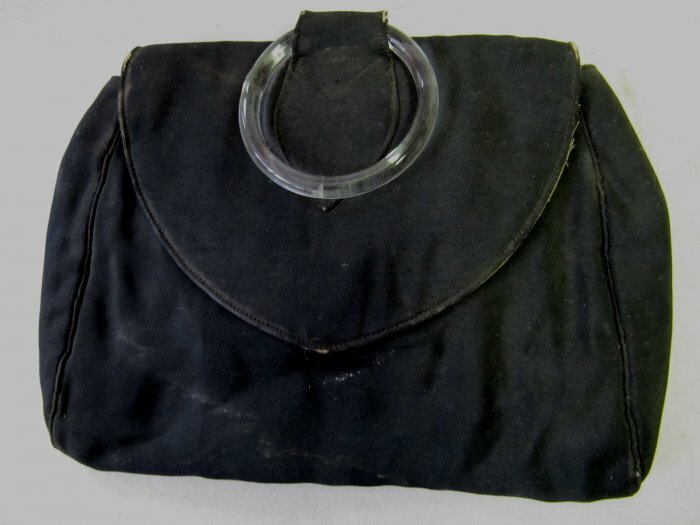 This small handbag was no doubt exquisite in its day. Now being sold as an interesting vintage collectible or for possible re-use of its parts, due to the fragile condition of the fabric. > Purse has a snap closure underneath the flap that is stamped U.S.F. Co.
> Inner lining is soft beige satteen with two inner pockets that contain a matching beveled pocket mirror and a small folded card case that closes with a snap. CONDITION: Exterior and interior fabrics are delicate, and in fragile condition due to their age. Black exterior has minor worn areas at top flap sides and at corner edge seams, and a small 1/2 inch tear below the snap area near the bottom of the flap. Exterior has faint traces of a water or liquid mark. Inner lining has age-related separation at the inner flap fold and detachment of one side of the inner mirror pocket. Mirror is intact, but silvering is faded, with dark spots and crackling. Vintage Needlepoint Pillow Brown w Pink Blue Rose Floral Design 19x11"